Inspiring Ideas with artist Jeanne Winters: The Ultimate Inspiration Board! My husband hauled this treasure home one day from the dump - A solid hardwood core and ALL the glass in perfect condition! 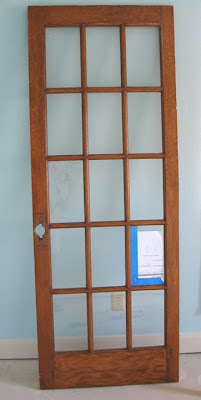 We thought we could use it to replace our pocket or office door in our 1930s home -- but alas, that never happened. Still, I had high hopes for alternative uses for it. First it was going to hang in the living room to showcase black and white photos. Then after our next housing move I knew this door was going in the office ... it just took a while to find it's way there! After hesitating over painting the wood, I bit the bullet. The wood grain was so beautiful ... but somehow it wasn't old enough to be "cool". So, black it is! Next came the cork. The sheets came in 1/8" an 1/4" depths. Since I was adhering it to the glass, I had to be sure the standard 3/8" push pins would not put any pressure on the glass itself. 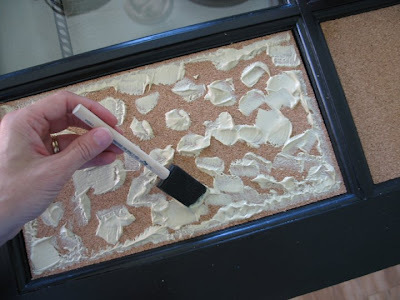 For a standard cork board, you can get away with applying a thin sheet of cork to a wood or MDF backing. Because the wood panes on the door are routed, I thought using two - 1/4" sheets and making a total depth of 1/2" would make the cork stick out too far. So, I chose to buy one roll and glue 3 - 1/8" layers on each pane. Phew! :-) It was recommended to use linoleum paste. Messy stuff!!! For aesthetic reasons, I opted to leave 4 panes uncorked. And after leaning against my wall for a few months, we managed to get this baby hung over the holiday break! Yeah!!!!!!!!!!!!!!!!! I snapped these pics so you can see my board clearly before I fill it up with my stuff! More studio pics and projects coming this month! Very Cool and inspiring! You did a great job. Okay!! I love that idea. I am going to show this to Keith... Wait...I will rethink this because before you know it I will have 10 old doors in my garage. Great idea!! LOVE IT! Really......a fantastic idea. Now......................if I could just find a door like that at the dump. :-) Great job! Oh my goodness...it is beautiful!!! Hope you had a wonderful Holiday!! I love this idea! 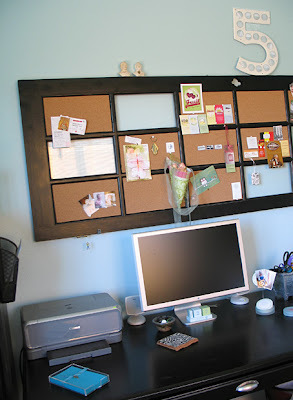 You could use your empty spots as a dry erase board. I just saw this idea the other day somewhere. So Beautiful! Thanks for your inspiration! That is just adorable! Thanks so much for sharing your wonderful project with us! Oh this is FABULOUS! I love how organized you could get with this. So much fun. I'll be linking! I love it! The empty panes are great too. what a good hubby to haul that home. Don't you just get sick sometimes thinking about all of the stuff that no one grabs from the dump? What a great project! Lots of room for your inspirations, and an inspiration itself. I love it! You're too amazing. Oh, to have an office! Love this idea, great job! What a neat idea ... I love it! fantastic idea! Thanks for visiting us at www.Econobusters.com and leaving a comment. We love input! i'm inspired...i was just at habitat for humanity....so many great doors! can't wait to do this! I need one of these! Great idea. Fabulous!!!! I love how it looks on the wall! What a great idea! Looks awesome in your office. That is GREAT! I need somthing like in my studio... hmmmmm... you have got me thinking! I'm amazed by your creativity! I would have looked at that door and just seen a door. And yet, you transformed it into a useful item. That reminds me of how God sees us and can use us. A piece of clay can be molded and used for His purposes and His glory. hello! i am looking for a good scripture to put on a canvas wall print i am making from a wedding photo, and i stumbled across your blog. you have INCREDIBLE ideas and creative talent. i am really impressed and might try some of your ideas! thanks for sharing! I know it's been a month since you commented on our new site, www.Econobusters.com, but I wanted to take a moment and thank you for visiting us. We hope that you will be back - we are blogging regularly and have so many great things to share this year. We are still getting organized and planning what we want to ad to our blog, but good things are coming! Thanks for being one of our first commentors - it means a lot to us! That is an awesome idea. My head is spinning now. Hee hee. Thanks for sharing. I Love it....I had a door like that forever in my garage wanted to do something with it and never did...when we moved I sold it at yard sale...wish I had kept it a little longer so I could copy your GREAT idea! Wow..that is so very exciting!!! I love this..I hope to find a door and do the same..you inspire! Stopping by from Kimba's... That is such and awesome idea!!!!! Great transformation! I love using old doors... So many options! Your blog is so full of great inspiration, thank you. This is easily one of the best ideas I've seen in a long time. Not only that, but you included a tutorial! Awesome! I love this project. 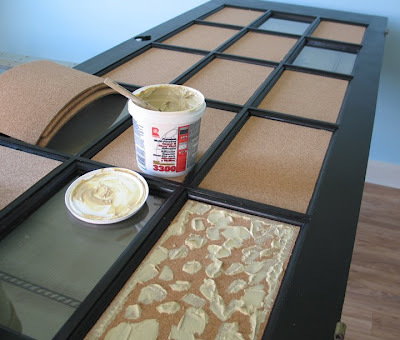 I just got 'another' window pane (I have five in my home now) and would love to do this. I've been planning on doing an inspiration board for a while and this is perfect. Would you mind if I grabbed a pic from this post to add to my blog post..I would link back to you? My daughter has 2 of these type of doors and she has yet to just go ahead and paint them. It's a big step! :) I love what you did with yours...I will show her and maybe it will inspire her to do something on the same order. I'm loving your blog. You have such beautiful creations and truly inspiring ideas. I love your inspiration board. I look forward to coming back often to get to know you more and see more great ideas. Blessings! Cuuuuuttttte door/memo board! Loooooovvvveee it! Love this! Sooo pretty and inspiring! I just covered my bifold closet doors in foam board and then Contact cork board. (In my "fun room") I love the room for putting up ideas but I need a pretty light-weight border to finish it off! Love your door!!! Amazing....I just love it. You have such great ideas. Keep them coming. Talk about perfect timing! My neighbors put two of these doors out in their trash yesterday...and I'd been looking at them since then...thinking, "I know they'd be good for something - but what????" Well, I saw your post, loved it, and ran right across the street just now! I'm still out of breath b/c they were so heavy! Phew. Now I just have to figure out where to use them (and how to explain to my husband who doesn't quite have the eye we do - he'll see a dirty, yucky old door!!!)! Many thanks. Just wanted to say that I linked to your post b/c it inspired me to take a window and make it something similar to your door! Wow, I cant believe thats a door. Great job. Happy SITS Saturday Sharefest! It looks great! Saw your link to this at SITS... I love it. This board is incredible. I'll bet you're still having tons of fun with it. 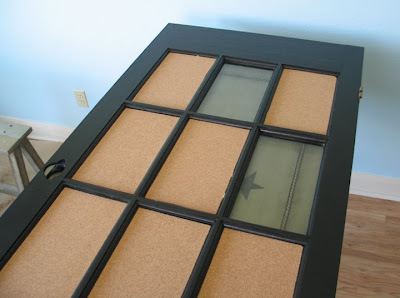 You could use the glass panes as a dry erase board too! I love your blog - stopping by from SITS! I love this! What a great recycle project! I love this idea. I am going to start looking for a door immediately. What a great use for that door!! LOVE it. Hope you have a wonderful SITS day. I LOVE this! I am here from SITS! I loved this idea! specially you calling it 'Inspirational Board'. its such a nice idea to put things that inspire together to get that vital positive energy flowing. 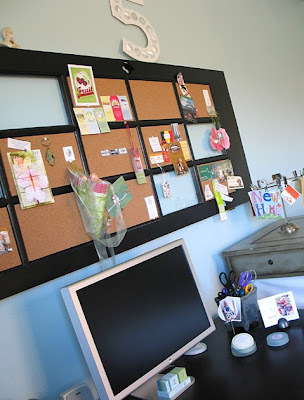 I loved this idea of you naming it 'Inspiration Board' its a nice thought to assemble things that inspire you to get that vital positive energy flowing. What a great idea...I really need one of these as well!! I would love to have a guest post from you on my blog...I'm sure my readers would love to hear what you have to say!! Hope you enjoyed your SITS day!